One of my favorite blues. In my M Lamy 2000 (read broad), the ink looks like a lovely very dark navy with teal tones. Love it. Happy Pan Pacific Pen Club Member! Personally, I'm quite disappointed in this color. Read all the reviews, checked the ink "swatches" and bought the bottle based on the colors I saw in the reviews. What I got was a green that was almost blue and a very similar color to PR's Ebony Blue. Definitely, NOT the blue I had in mind. And have tried in a variety of pens with a variety of nib widths on a variety of paper, so it's not just in one pen with one nib. Nice scan, chkuo. I agree with your assessment of the great properties of this ink: shading, no feathering, perfect flow. It's my "problem pen" ink, it's just so well behaved. But the "Navy" name is misleading. Navy Green, maybe? In real life it is definitely a bluish green, based on the sample of 2 bottles from different batches. Nice saturated cheery color, but not what I'd think of as Navy Blue. For a water-resistant true Navy Blue my favorite pick is Platinum Blue-Black. I've found that it's a little like Legal Lapis in the sense that the colour is very much dependent on the pen you're using it in, and sometimes the paper. In my wet writers, I do indeed get a dark blue with hint of green - but I recently put some in a dry, fine Lamy Safari and it looks just as you described - green that is almost blue. I see that you have used several different widths, though - so I suppose the other possibilities, are - is the bottle well shaken? have you tried pens that are wet as well as broad? Or, it could just be the variety in batches, which is not a happy thing, but it does seem to happen. On a last note, I find that I get a colour I really like by just adding a little bit of a blue leaning to violet - Aurora blue, for instance - it takes out a good deal of the green. But I agree that it's annoying and fussy to have to mix. Honestly, I think that's enough between nibs, pens and papers. Altho I did do a swab with cutip and the results were a navy,altho not the blue I've seen in the tests on the forums. Try adding a little bluish red, any of the rose colors. this will cancel out the green, and make the ink a little darker in the process. Easy does it, not much is required for the shift. Try a very small batch, I think you will like it. 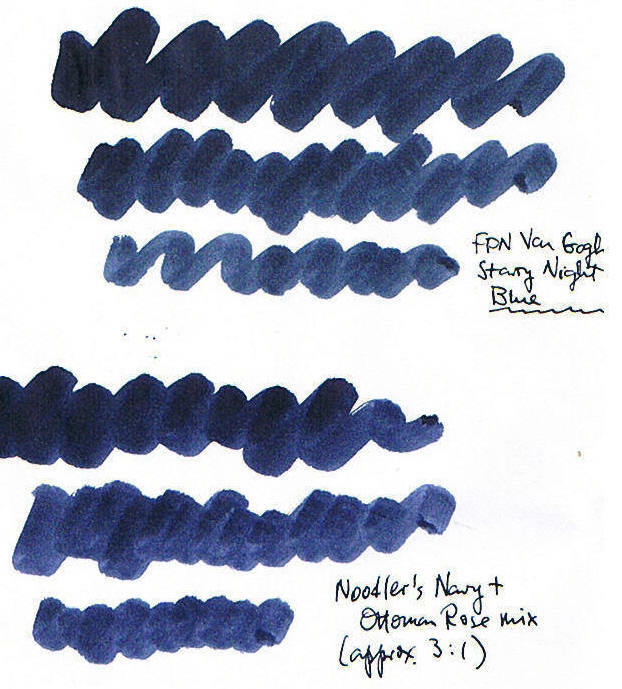 I'm not a big Noodler's fan, but Navy is probably my favorite ink from that label. Perhaps you got an "off" batch or something, but the bottle I got was very close to what's pictured in this review (on my monitor). As in, a really nice, dark blue that shades into a lighter blue, with perhaps a touch of turquoise, but no overt green. It could be that your pen runs really dry. Edited by JJBlanche, 01 April 2009 - 19:18. I got that ink but was disappointed to find the tint of green/turquoise in it.. I wanted a proper blue ink and the darker the better but on several types of paper I used it just looked greenish. I probably will never use this ink. the bottle I got was very close to what's pictured in this review (on my monitor). As in, a really nice, dark blue that shades into a lighter blue, with perhaps a touch of turquoise, but no overt green. Actually this is from the ink sample that you sent me a while ago, so it should be close to what you have. EUREKA!!! On jjblanche's suggestion(where perhaps my nib was too dry), put the ink into a vintage Conway Stewart with a super fexible nib and AHA. Got the Navy I was anticipating. Then changed one of the Lamy "M" nibs for a "B" nib and there it is again. SOooo lessons learned: navy needs a very broad or wet nib to get its properties to come alive. Try adding a little bluish red, any of the rose colors. this will cancel out the green, and make the ink a little darker in the process. Interesting idea, must try that with some Ottoman Rose. A 1:1 mix of La Couleur Royale and Navy makes a dignified dark blue. Of all the Blue-Blacks I've tried so far, this is without a doubt my favorite. It is the color I *wanted* to get when I ordered PR Ebony Blue, and I would recommend it to anybody who wants a wet, free-flowing blue with adventurous green tones, depth of character, and dynamic shading properties! I think I'm basically done with Private Reserve ink -- there's not one I've liked as much as I wanted to. Interesting idea, must try that with some Ottoman Rose. OK, here it is. As you can see, very much like FPN Starry Night Blue, but a touch bluer, and more vibrant. Any idea how this navy compares to PR midnight blues? More shading perhaps? They're in the same family, I'd say. Not sure about shading. With the right nib and paper, Midnight Blues has produced some nice shading for me, and I wouldn't be surprised if this mix did the same. Anyone else have a massive problem with drying time with this ink? I love the color but I always get smudges and ink on my fingers. I've read maybe diluting it with a little water will help? Personally, I'm quite disappointed in this color. Read all the reviews, checked the ink "swatches" and bought the bottle based on the colors I saw in the reviews. What I got was a green that was almost blue and a very similar color to PR's Ebony Blue. The color was not what I expected to be too. To my eyes, it is blue, but borderline teal. The green part is especially noticeable if you compare it with PR DC blue. The OP's scan makes it a bit more blue than it really is. I followed done of the other poster's advice and added a small amount of Eel Cactus fruit. Not its much better, a dark blue, not quite blue black with a tiny of green.